In the lap of Himalayas nestled an attractive spot encompasses by the flora, the colorful surrounding, and the destination that uniquely decorates the Himalayan beauty. 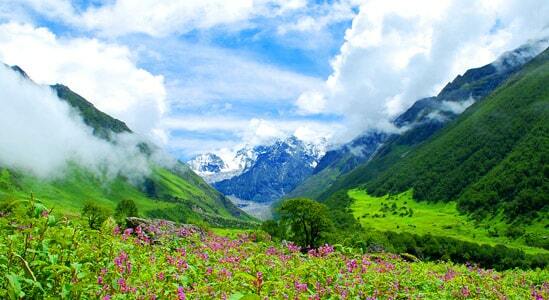 Valley of flowers the most beautiful valley trek of all time in the Uttarakhand trekking destinations, the flower trek offers the rarely seen blossoms such as the blue Primula glowing, the best time for the valley of flower trek is between mid-July to mid-August. The journey starts from the Govindghat for which there is a direct drive from Haridwar/Rishikesh/Dehradun, on the way you encounter Hemkund Sahib the shrine of Sikhs. Observing the streams through the valley will be so beautiful, the scenario of the valley is gigantic, the whole journey in the valley of flowers cost a nothing more, but fitness as the trail will be steep but an amazing one. The beauty of Hathi Parvat and Saptrishi peaks will make you feel so happy in the whole trip to the valley of flowers, and the valley of flower itinerary will not get you into any trouble as you can spend your days in ease. One who has an experience of trekking can do it quite quickly, but it will be a hard trek for the beginners as the pathway has steeps and the descent will be a little tricky. The patches and steeps can create a hurdle for beginners to trek towards the valley of flowers, and it can become a tiring trek, but people with a decent fitness can trek to valley of flowers. Valley of flowers Trek in Uttarakhand could be the most magnificent and incredible journey for the trekkers amongst all the Uttarakhand Trekking destinations, but again the difficulty is still there as the pathway will not be little hard to walk, and higher altitude climb can make it an arduous trek for the trekkers but your will power can make you conquer it. 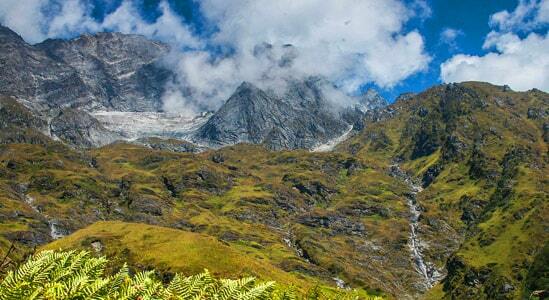 This Himalayan trek is graded as Easy to Moderate trek, so it’s an excellent choice to take the family to this trek. Though it can be little hard as the trail will be steep but can be done if you have an ability to not giving up, and maintain a decent fitness also, as the valley of flowers trek has tricky patches, but a well-planned itinerary of the valley of flowers Trek will make it less tiring for the trekkers. 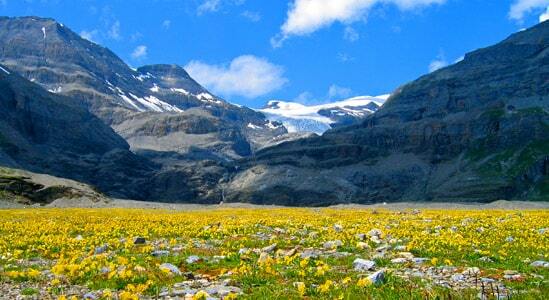 The altitude of the valley of flowers Trek is 12,100 Ft. one can attain the maximum height depends on the subject to his endurance, and other conditions such as a climate, temperature, the trek will open up the rarely seen flowers and the valley like a scenery painted on to the canvas. The things that one has to keep in mind is to take a proper medication with them at the higher altitude, though we provide every possible thing it is always better to keep your medicine according to your health, Hydration is the most important when you will trek to the higher altitude, so keep your body hydrated while trekking to Valley of flowers. The best season for the valley of flowers Trek is from mid-July to mid-August; a trek to this admirable destination can be planned between these months as the goal glows the most, whereas the whole year this magnificent destination is always wrapped into the blanket of snow. The Destination offers the splendid view; the landscape is beyond imagination, the enormous mountains wrapped with snow looks mesmerizing. Enriched by the glory of nature Trekking in Uttarakhand can be the best experience in all seasons, where this trekking destination valley of flowers is no doubt a delightful one. The maximum temperature in this area goes up to 17°C, and the minimum goes down to 7°C. There is a vast difference in the mountain temperature, It is essential to bring all warm clothes, and that may not even affect the backpack too much. Valley of flower Trek is settled at an elevation of 12,100 Ft. Valley of flower Trek is the most fantastic trek that offers the unusual mix of breathtaking adventure and admirable beauty, the entire voyage of Flower trek doesn't just an experience but a lifelong cherishable moment it makes one forget all the fear in them and just behold the beauty of flowers. Valley of flower Trek is a sublime trek among others when it's tied in with trekking in Uttarakhand, as Uttarakhand has bunches of goal for trekking and there is no uncertainty that each one is thoroughly entrancing, the Himalayas are the shelter for India, like this trekking in India in the most popular. 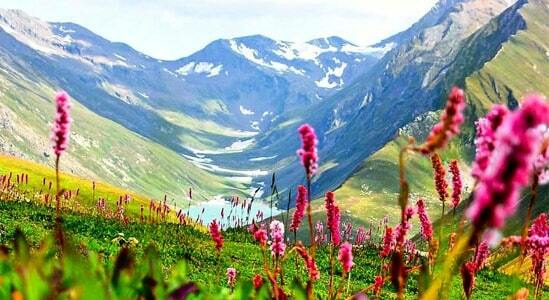 The most exotic trek that opens up the perspective of colorful flowers, Snowcapped famous peaks, and adventure, thrill. Where Valley of flower in Uttarakhand takes you through the massive mountains and the breathtaking view all through the way it won't keep you quiet by any stretch of the imagination; instead every vista towards valley trek will energize you to achieve the goal. The wellsprings that stream downwards and converge with streams all through the way and the snow applauded mountains the flowers butterflies and the fragrance alongside the scene in the entire voyage will be treated the eyes of each trekker with the natural gifts. Nestled in Uttarakhand, the place that is well known for trekking, there is n number of treks in Uttarakhand, Trekking in Uttarakhand is the most worth living experience at least once in a lifetime. The journey to Flower trek will start from these places Dehradun/Rishikesh/Haridwar, the drive will lead you on the Badrinath road through Rishikesh, on the way you will come across many beautiful places, and the mountain culture that will be seen in the abundance. The whole drive will be of around 9 to 8 hrs; it would be better to kick off your journey early in the morning. The journey will be little arduous if you are the first time in the mountains, as the curves of the road may cause a little motion sickness or drowsiness, therefore, it would be better to take a halt when you feel so. Along with the little hardship in the journey, nature will be your friend treat you with the mesmerizing view of the mountains, and the Himalayan range, you will be excited in the whole trip to reach the Valley of flower in Uttarakhand as soon as possible. Trek Gradient: Gradual ascent on a stone-paved path, all the way along the river. Water sources: Water is available along the route. On the 2nd day of your voyage towards Valley of flowers will begin from the Govindghat to Ghangaria trek which is approx. 25 Km, you will be able to encounter the Vishnuprayag. Trekking to this worthy destination Valley of flowers will be like a fairy tale, as more adventure in the floral beauty will make you go crazy; the place is rested in Uttarakhand Himalayas and is well known. Therefore trekking in Uttarakhand is widespread, though not in Uttarakhand trekking in India is itself a beauty as the Himalayan range offers the fantastic vistas. The drive on the 2nd day will start from Govindghat to Ghangaria in the morning after breakfast around 4 Km drive will lead you to Pulna, it would be around 9 Km high routed along with the river Pushpawati. The entire trail from the starting point will be full, along with many snacks stalls that would be beneficial for you that you will not walk with hunger, the trek will be on the stone paved path, and built with stairs. After some time of the walk, you will reach the Bhyundar village, and this village offers the fantastic viewpoint of Hathi Parvati sights celebrating the beauty of the site would be an amazing, as later you will move to Ghangaria by a steep ascent. Later you will reach the Ghangaria and chill out in the destination and prepare yourself for the next day with each step towards Valley of Flower you admire this trek and the beauty of Uttarakhand trekking in the lap of the Himalayas. Trek Gradient: Mixed incline till the valley followed by a level walk on grassland. Water sources: Can refill water bottles from streams on the way. On your 3rd day, the wait will be over after few hours as the 3rd day will be the final day to the Valley of flowers, this wonderful valley trek will make you feel the beauty so deep, as this flower trek will make your eyes so soothing. The voyage to the Valley of flower trek will be around 4 Km away, and the valley is 5- 8 Km long, actually the distance depends on the trekker totally, another essential thing is stamina that is necessary for the trip to Valley of flowers. When you start your day with Ghangaria after 30 min you will witness the forest check post, and later the waterfall name Laxman waterfall will be seen as the center of attraction, the thick layer of a white will seems like ice the crystal clear water will make your day. Few more time in the greenery later looking at the Pushpavati river flows below the ridges will be so captured, the trail will be steeply, and tone paved, and you will be able to see many bridges and the landslide areas. When you enter the valley you will be mesmerized by the beauty of it; you will go crazy by looking at the beauty that you have never seen before. The Valley of flower trek sets four moons in the Himalayan range the blue poppy, snake foil, white leaf hog foot, Himalayan Rose, meadow geranium, and other beautiful flowers the butterflies with of a variety of colors. The colorful blossoms end after 5 km and stretch till glacier, and you will also be able to see the Nilgiri Parvat, Bhyundar Khal, Rattaban, Gauri Parvat, etc. if the weather will stay clear. Trek Gradient: Gradual and steep mixed ascent on a stair welled stone-paved path. Water sources: Can refill water from roadside dhabas. The 3rd day will be so astonishing, the beauty of Valley of the flower will blow your mind and on the 4th day you will get ready early in the morning, and after breakfast, the trek will lead towards Hemkud Sahib that is around 6 Km. Hemkund Sahib is one of the most sacred shrines of Sikh, Hemkund Sahib is the highest Gurudwara in the world that is nestled at an altitude of 14,205 Ft. The trail on the 4th day will same as the previous trek such as stone paved ways and continue ascent will be there, on the way you will see many shops where you can have your snacks and can energize yourself. Beholding the beauty of rare flower Brahmakamal that will be seen beside the pathway the Hemkund Sahib is nestled beside the glacial lake Humankind, in the clear sky you will be able to witness the magnificent reflection of the Saptrishi peaks, the lake occur with the melting of Hathi Parvati and Saptrishi peak. The Laxman temple will be found near the lake, and the beauty of the valley of flowers will look so exotic, there is no doubt that trekking in the Himalayas is nothing more than a boon as India occupies the Himalayan range in abundance; therefore, trekking in India is another beauty. You will be able to observe a lot of rare thing in the valley of flower trek in Uttarakhand, and it is one of the well known when it’s about trekking in Uttarakhand encompasses by the Himalayas. On 5th day the trek will return to Govindghat after your breakfast in the morning you will descend to Govindghat, and you will keep the memories of this beautiful valley of flower trek with you, the blossoms will be in your heart for life, this wonderful trek in Uttarakhand is so attractive, as trekking in Uttarakhand is so beautiful in the lap of Himalayas. Valley of flower trekking will blow your mind and soul and will make it the most ultimate trek for you of all time the valley of flower cost nothing but physical fitness and this trip to the valley of the flower will create beauty in your mind for trekking in India. On the 6th day, the journey of the valley of flower trek will be over by returning to Govindghat, and from Govindghat the drive will head towards Dehradun/Rishikesh/Haridwar. The ride from Govindghat will start early in the morning as it will take around 8 to 9 hrs to reach any of these three destinations. Acclimatization is another important aspect when it comes to getting an adaptation to the climate at the high range treks. A day rest is not just the rest but a chance to get used to of the place and its habitat. The trek expense of Rs. 7,300 + 5% GST takes care of all expenses of the trek from Govindghat to Govindghat. Backpack offloading charges - If you wish to offload your backpack, there will be an additional charge of Rs. 1200 + 5% GST. The backpack cannot weigh more than 9 kgs. Suitcases/strollers/duffel bags will not be allowed. Please note that charges will vary for last minute offloading in case you decide to offload your bag after reaching the basecamp (Rs. 1,400 + 5% GST). Online offloading in advance is possible up to two days prior to the trek start date. Buffer day – It is mandatory to have this extra day as any bad weather or rain will delay your pass crossing. If buffer day is utilized, you will need to pay Rs. 1,450 + 5% GST. This amount is to be handed over to your trek leader.